Celebrating the life of Albert Alphonse Link, Jr.
Obituary for Albert Alphonse Link, Jr.
Albert Alphonse Link, Jr., age 84, of DeWitt, MO went to be with the Lord on Wednesday, November 21, 2018. He passed away peacefully at his home. He was born on March 22, 1934, to Albert A., Sr. and Emma Laura (Bruemmer) Link in Indian Grove, MO. Albert and Darlene F. Beall were married at St. Peter's Catholic Church in Marshall, MO on June 4, 1960, by Father John F. Kenny. To this union, three girls were born: Lorraine, Alena, and Rhonda. Albert attended the Keytesville, MO and DeWitt, MO elementary schools and graduated from Brunswick, MO high school in 1953. He served in the United States Army during the Korean War, serving stateside duty in the state of California. Albert was a faithful member of St. Mary's Catholic Church in Carrollton, MO, the Knights of Columbus, AmVets of DeWitt, and the DeWitt Community Club. He was a DeWitt Township Board member and a member of the Brunswick Levee Board. 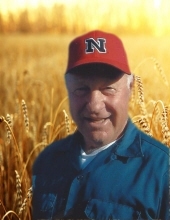 He was a mechanic at McClure-Heins Auto in Carrollton and he worked on a tugboat on the Missouri River after high school and had his own furniture store in Carrollton before becoming a full-time farmer. Albert is survived by Darlene, his wife of 58 years; their children: Susan Lorraine Riordan and husband, Jim, of Scottsdale, AZ; Alena Helm and husband, Troy, of Richmond, MO; and Rhonda Pottorf of Taipei, Taiwan; six grandchildren: Calib (and Susan) Bruce, Nathan (and Keshia) Bruce, Jessamin Jensen, Adam Berg, Sarah Berg, and Damien Pottorf; eleven great-grandchildren: Kayla Bruce, twins Kyler and Kaitlyn Bruce, Samuel Bruce, Lily Bruce, Archie Bruce, Autumn Bruce, Marlee Jensen, Jameson Jensen, Avery Jensen, Adilene Jensen; four sisters: Mary Luetta Jenkins, Joan Reed, Dorothy Ann Van Dusen, and Katherine Martin; one sister-in-law, Stephany Link, one brother-in-law, Wayne Reed; and several nieces, nephews, and cousins. Albert was preceded in death by his parents, two brothers, one sister, four brothers-in-law and numerous family members. The rosary will be recited at 6:00 p.m., Thursday, November 29, 2018, at Foster Funeral Chapels, led by Deacon Kappler. Visitation will begin immediately after the rosary from 6:15 - 8:00 p.m. at the funeral chapel on Thursday, November 29, 2018. A Mass of Christian Burial, with Father Ken Criqui, will be held at l0:00 a.m. on Friday, November 30, 2018, at St. Mary's Catholic Church, 211 E. Shanklin, Carrollton, MO. The burial will be in St. Mary's Catholic Cemetery, Carrollton, MO. The family suggests that contributions be made to the Lewy Body Dementia Association. To send flowers or a remembrance gift to the family of Albert Alphonse Link, Jr., please visit our Tribute Store. "Email Address" would like to share the life celebration of Albert Alphonse Link, Jr.. Click on the "link" to go to share a favorite memory or leave a condolence message for the family.